49ers Chris Borland retires from NFL after due to concussion concerns. 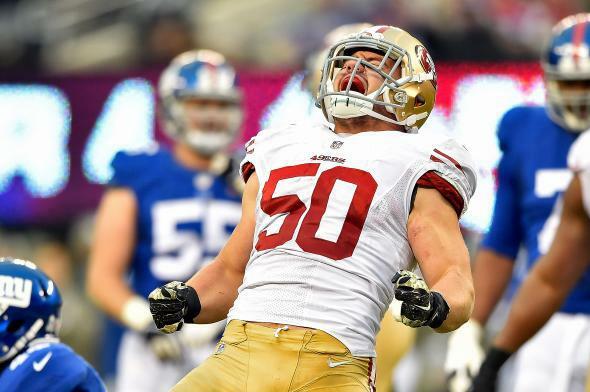 Chris Borland celebrates after a tackle against the New York Giants. San Francisco 49ers linebacker Chris Borland told ESPN’s Outside the Lines on Monday that he is retiring from the NFL due to concerns about potential brain injuries sustained through the repetitive head trauma of playing in the league. The issue of player safety when it comes to the long-term impact of concussions is on the rise in the NFL, but Borland’s decision ups the ante significantly, because the 24-year-old has played only one year in the league—14 games—and decided the health risk was too great to continue. The third-round pick in the 2013 draft said he told the 49ers of his decision Friday. “He said he made his decision after consulting with family members, concussion researchers, friends and current and former teammates, and studying what is known about the relationship between football and neurodegenerative disease,” according to the Associated Press. Borland’s concerns began almost from the moment he entered the league before the 2014 season. Borland is walking away from the remainer of a four-year contract with the 49ers worth almost $3 million.